Lady Cat(herine) Get Her Claws out! Jane Austen on Twitter – it’s not easy! This is a really hard concept to get your furry head around! 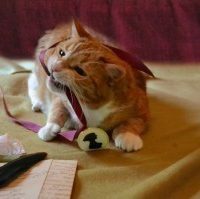 Why Jane Austen and Cats? A Writer’s Inner Cosmos or Don’t Underestimate Yourself! Wickham or the Nameless Narrator of The Aspern Papers? Jane in the morning and Jane at Night!